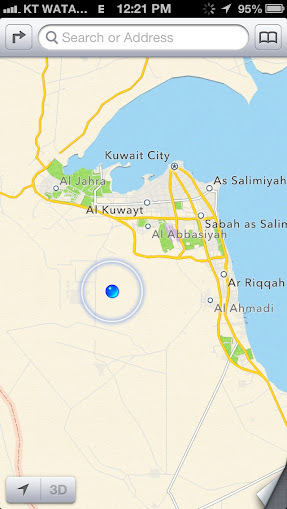 Update: I found this post of a Kuwait blogger who went “behind the scenes” at the camel races. Jealous! Saturday we had one of those moments where we realized that we live in Kuwait. In the desert. Seriously!? We joined 250 other people at the AWARE Center, climbed on buses and headed into the desert. After about 45 minutes we arrived at the camel races…in the middle of nowhere. We had the opportunity to ride camels. We decided against it. NOT! We went back to the diwaniya to watch the start of the camel race on TV. The older the camel the longer the race. The races on Saturday were 6k and 8k. They start far away and finish at the grand stands. The whole time there are cars following along on the outside of the tracks. Luckily people don’t ride the camels (except for this crazy guy), robots do! The people in the cars control the robots and their little flexible arm that spins around and slaps the camel. It’s crazy to watch! Although we didn’t start our watch (what kind of runners are we?! ), we think the camels ran 6k in 10-15 minutes. The weather was pretty decent (not too cold, not to hot and cloudy) the wind did pick up and we got to taste some sand. The Kuwaiti men had the right idea covering their mouths! After the last race (there were 3), we headed to a ‘farm’ in the desert for the typical buffet spread. All sorts of Lebanese food. Sorry for the crappy iPhone photos! Just another day in the life of Lissa, Jeff & Abby! To see our entire photo album, click here. Or watch the video below! You all are so awesome :). I hope you had a blast on your camel rides!